In your document library, select the blue Share Documents button in the bottom-right of the screen. Check the box next to each document you'd like to share, and when you're ready hit the green Next button. The next screen has two columns, one for recipients and one for documents. First, identify the names of the people who will be receiving (and/or signing) the selected documents. Some names will auto-fill if they've been entered as contacts previously, though if you're adding a new contact we'll ask for their email address in a following step. By default, documents will be set to sharing for view only. This means your recipient will receive a copy of the document for their own records. If you want to request an e-signature on a document, toggle the blue box on that document to signature and a green button will appear to create a template. Mark-up the document using the available boxes along the top bar of the document. As you drag each annotation type onto the document, identify who will complete the field and whether or not it's required. Click the blue continue button and provide a name to save the template. This can now be re-used again for different recipients, or edited later to provide modify fields on this document. 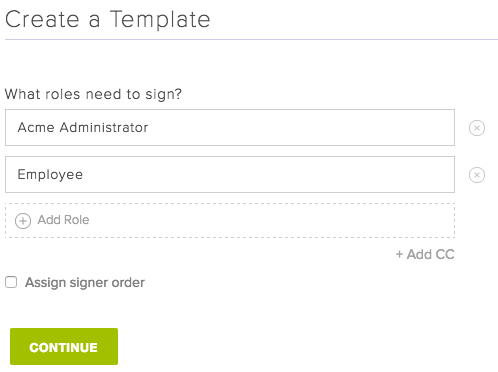 Once the template is saved, you can click the blue next button to move to the next step of signing. 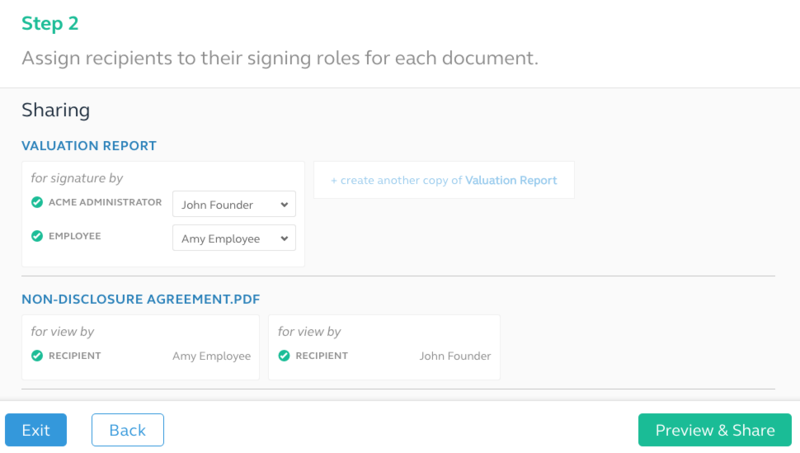 The review screen will show you documents to be shared for view and for signature. Anything shared for view will be broken into unique versions for every recipient you've listed in this flow. 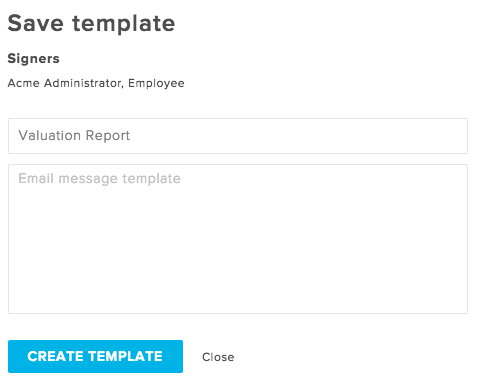 Documents requiring signature need you to associate the recipient to each template role. If you're sending unique versions to multiple people, click +create another copy and you'll be able to associate additional recipients on the new version. 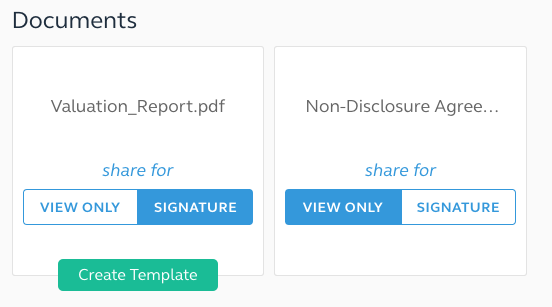 If you're not requesting signatures, simply click Share after identifying your recipients and documents. If you are requesting signatures, click Preview & Share from the Step 2 screen to preview each signature version before sending. While you're previewing, you can make any last minute adjustments to each document version before sending. 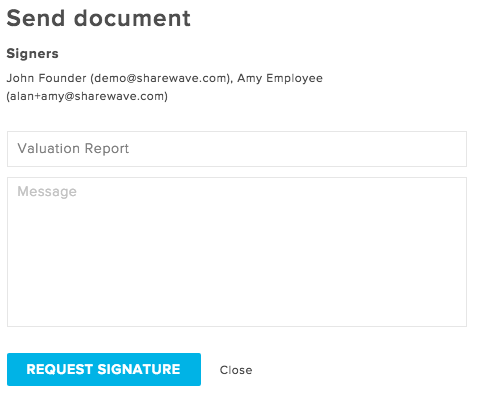 When you're ready, click Request Signature to email each recipient with the signature request. Note: we do not send any documents over email. Instead, your recipients will receive an invitation by email to view shared documents on Gust Equity Management. They'll have their own document repository holding each document shared from your company, and you'll always know exactly what documents they can access.